Status: Alive and well, thanks. 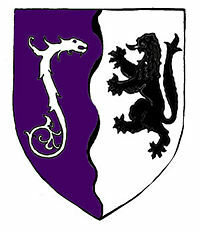 Per pale wavy purpure and argent, a serpent, glissant palewise and sinister facing, argent and a wolf rampant sable. 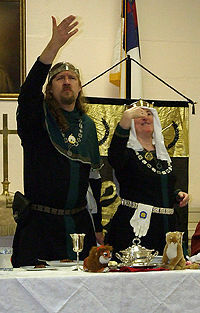 Alexandre is honoured and humbled to be the Sixteenth Tyger of the East. As of 1 September 2013, Alexandre is a resident of Drachenwald, specifically Insulae Draconis - in modern parlance, England. This page was last edited on 26 November 2018, at 09:43.